Berhampur- the fourth most populous city of Odisha is easily accessible from Bhubaneshwar and Cuttack and has some of the best street food in Odisha. Also known as Silk city, Berhampur is a major trading centre for spices, tamarind, clothes etc. We started our food journey in Berhampur by visiting the Bara Bazar- a major trading hub. The two most valued food items in Berhampur are Papad and Pickles. We were a bit sceptical when Jagdish, who runs a facebook page by the name Discover Berhampur straightaway took us there. But it was a divine experience to sample almost 25 different varieties of pickles, our favourite being Navratan pickle – sweet, spicy, tangy, made with dry fruits and cherries. We got some papad made with dal and sesame seeds packed to take back home. They are really amazing. We also spotted Nabat in all the shops – a mix of jaggery and sugar, used for making a refreshing summer drink. On the way back, Jagdish took us to Balaji sweets in Bada bazar for Malpua and Rasbali. Malpua is offered to Lord Jagannath in Puri. Back home, malpua is made during the Holi festival. The dough made up of white flour is deep fried and dunked in sugar syrup. Rasbali is flattened deep fried chhena soaked in condensed milk (rabri). Our best meal in Odisha was at Pidha Hotel at City High School Road. Started by Arjun Sahu 50 years back, the shop is now run by Nilanchal Sahu. The restaurant opens up briefly for lunch from 12 noon to 3:00 pm. The word pidha means “a wooden low-rise chair”. The best mutton curry we had in Odisha was at this hotel. The whole experience of eating here was incomparable. One needs to take off their shoes to enter the restaurant and on a pidha (on the ground). A dried eco friendly leaf is spread in front of the diner. A generous helping of rice with dal is served with charu pani (similar to rasam, made with tamarind and turmeric) in a small bowl. And finally comes the show stopper, in another dried plate- mutton curry- small pieces of mutton cooked in a thick gravy, with a few spices and enriched full of flavours. It was simply delectable. In the evenings, Pidha hotel serves biryani. We wish we had more time in Berhampur to try their biryani. One place which was highly recommended by everyone on social media was Hotel Girija, Girija Chowk for chicken pakoda and pudding. I quite liked the pudding but pakoda wasn’t what we were expecting. Next stop for lunch was New Biryani Centre, at Corporation Road, Biju Patnaik Park. 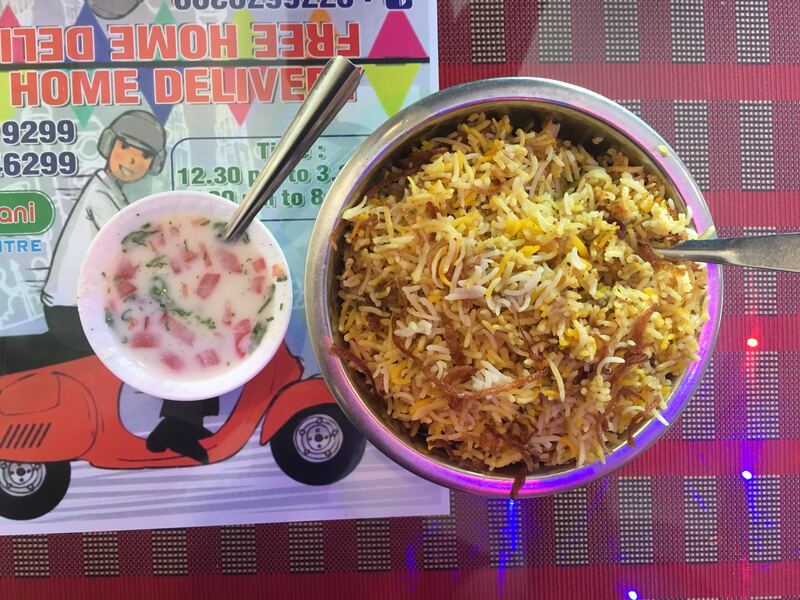 What we liked about this 27 years old establishment was a clear distinction between Biryani and Pulao. Biryani is layered with chicken and rice while pulao is meat/chicken fried with rice. We tasted both and enjoyed the fragrant non-greasy rice with mutton. As mentioned in the earlier blog about biryani in Cuttack, the biryani here is a mix of Awadhi and hyderabadi style. Biryani is accompanied with Dalma and Pulao with baingan ka dalcha. Another great experience was of trying kebabs straight from skewers at Rahim KGN Kebab shop, Corporation Road, in front of Biju Patnaik Park. The shop is managed by two brother Sharukh and Rahim. They have 3 different kinds of kebab- chicken, mutton and prawns priced at 10, 20, and 30 respectively. The small marinated pieces of meat are barbecued over charcoal. Once barbequed to perfection, some masala and lemon are sprinkled on the kebabs and the skewer is handed over to the customer. One can eat right from the skewers. KGN also offers brain and trotters in their menu. We also tried two different kinds of snacks from the street at City High School road. The two food carts adjacent to each other sell mix chakuli and sprouts chaat. The chakuli shop is run by Tumba Nath and Sprouts chaat shop by L Somesh Patro. Mix veg chakuli – made with the batter of white lentil and vegetables are first pan fried then crushed on the pan while frying. It gives it a crisp texture. Next to mix veg chakuli shop is another cart that sells pan fried sprouts- a mix of matar, chana, moong, onion, tamarind, tomatoes, carrot, ginger and spices. The highlight, however, was the ghughni chaat at Sri Ram Ghugni stall run by Pinto. Started in 1992, they make the best ghugni chaat in town. This place reminded us of Tamatar ki chaat of Varanasi or tokri chaat of Lucknow. A perfect chaat should be a mix of many ingredients – sweetness, spicyness, tanginess, crispiness, softness – all in one. A treat for the eyes- everything you can wish for is added to the ghugni- tomato, bada, ghugni, sew, boondi, onion pakoda, spices, lemon and whatever else is available at his stall is added to the ghugni chaat. 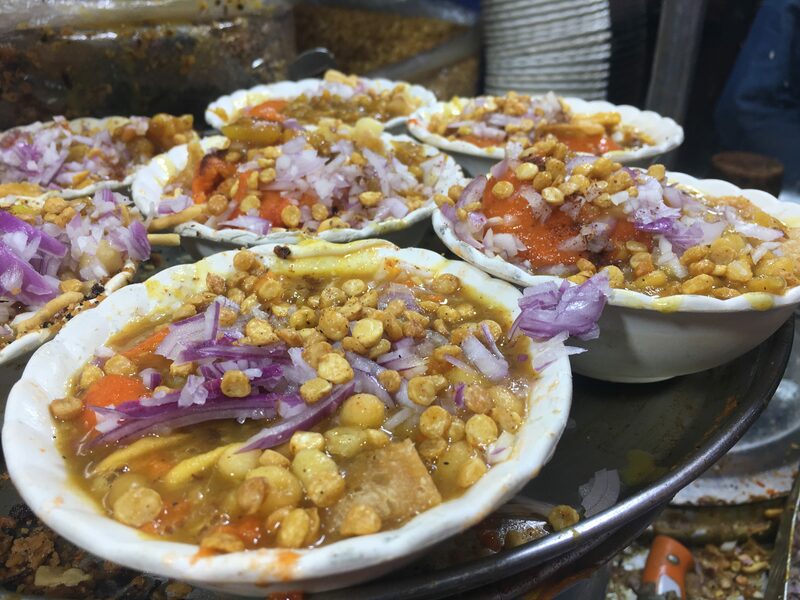 We can rate this place as one the best chaat we ever had anywhere in India. The most popular berhampuria breakfast dish is Puri and Upma. A perfect example of south meets east. You can spot puri umpa stalls everywhere in Berhampur in the morning. This is the soulfood of Berhampur. 2 pooris are put in a dona, topped with normal upma, masala upma, ghugni, sambar, chutney, and sooji halwa. It has to be relished from hands devoid of a spoon. The best place to go for Puri upma is Samala Hotel in Annapurna market. 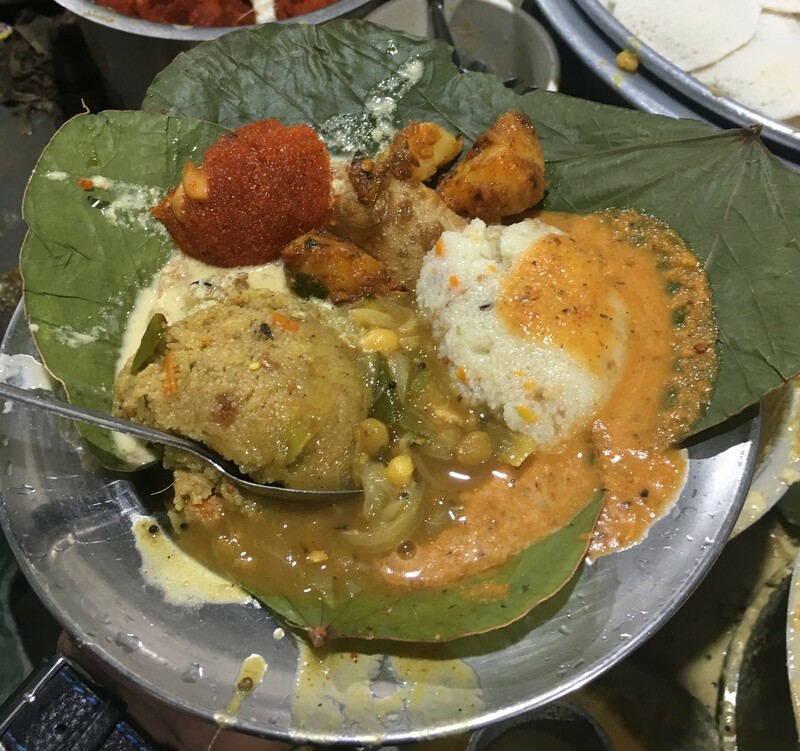 In Berhampur, I met Vaishali – the most enthusiastic foodie in town. She loves her city and knows the food places inside out. She is so enthusiastic that she can ask you to jump from the rickshaw if she finds something interesting to eat. And it did happen at one place. On last evening in Berhampur, she literally stopped the rickshaw midway at Giri Market, at Kishore pakoda cart to let us try three snacks- saku, papu segudilu, and jackfruit chips. Saku is a close cousin of big size idly – steamed one side and pan fried on side. And Papy Segudilu is big size ring shaped snack made up of rice flour,turmeric, hing, green chilli and salt, that are boiled and made into dough. Then they are coated with sesame seeds, made into rings and deep fried in oil. We ended our journey at Billu dhaba- a dhaba run by Gurmeet Singh. Gurmeet Singh’s father bought the land in 1986 while working as a truck driver and made this a full fledged dhaba in 1991. This is the place for north Indian style food in Berhampur. I also learned a new dish Egg Tadka- scrambled egg mixed with black lentils, fried in spices and topped with cream. A delightful journey from one of the hidden gems of the country!